Following Donald Trump's election and ahead of the release of early-stage data for its multiple myeloma drug bb2121, investor optimism soared. After business-friendly Donald Trump's presidential victory, and ahead of phase 1 interim trial results for its multiple myeloma therapy on Nov. 30, shares in bluebird bio (NASDAQ:BLUE) soared 24.7% last month, according to S&P Global Market Intelligence. Fear that drug pricing would fall into the regulatory crosshairs if Hillary Clinton won the White House decreased after Donald Trump was elected on Nov 8. Trump ran on a deregulation, free-market platform that suggests biotech companies have less to worry about now that he'll be the next president. Trump's industry-friendly status sent Bluebird's shares soaring from $46.10 on election night to $63.60 on Nov. 15. Shares continued to climb into the end of November after management told investors on Nov. 14 that they would present interim results from Bluebird's multiple myeloma phase 1 trial at a symposium on Dec. 1. 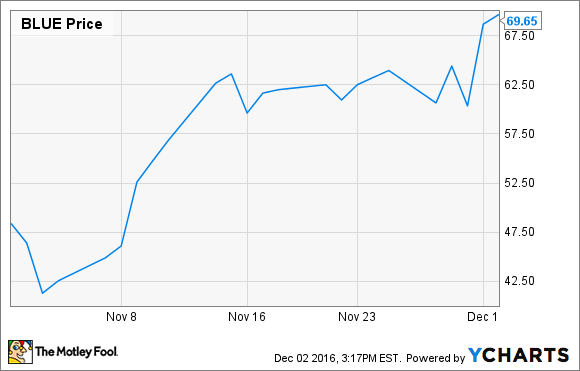 Management reported interim data ahead of the symosium on Nov. 30, and it didn't disappoint. So far, Bluebird's bb2121, which is being developed in collaboration with multiple myeloma powerhouse Celgene (NASDAQ:CELG), is delivering both high response rates and top-notch safety. In the nine-person trial, bb2121's response rate was 78%, including two complete responses that were maintained at the four- and six-month mark, respectively. Furthermore, no dose-limiting toxicities, grade 3 or grade 4 cases of cytokine release syndrome, nor any grade 3 or grade 4 neurotoxicity have been observed yet. The results are intriguing because the average person participating in this study received a median six prior treatments before receiving bb2121. Assuming that bb2121 continues to produce high response rates and solid safety in tough-to-treat patients like these, it could someday reshape multiple myeloma treatment. Of course, it doesn't hurt to have Celgene's significant experience in the indication at its disposal, either. Celgene already markets the best-selling first-, second-, and third-line multiple myeloma drugs on the market. Nevertheless, there's no guarantee that bb2121's future studies will pan out, and given that more than 90% of cancer drug trials fail, some caution may be warranted now that Bluebird's shares have catapulted its market cap to $2.6 billion.